January 2019 FOTM Card Kit ~ Alternative Cards ~ No Coffee Here! Hello there! 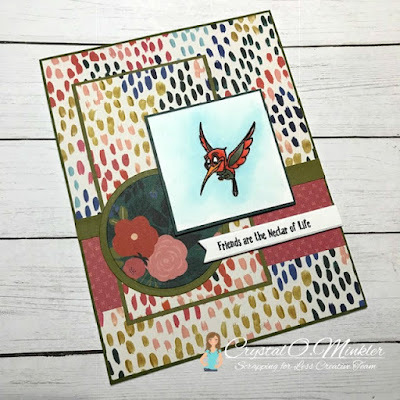 Crystal here and today I am sharing a couple more cards that I created using the January 2019 Perk Up and Start the New Year card kit. I challenged myself to create a couple of cards using the kit that didn’t actually have any coffee related items on it. I know that not everyone loves coffee as I do, and I have a few friends who won’t touch the stuff, so I thought it would be fun to create a couple of cards for them. And to my delight, it was very easy to design these two cards. You’ll notice that both cards have very similar design with just the slightest of difference being the placement of the elements. The reason for this is that I had to cover some portions of the papers that had been used in other cards – for example a small circle is hidden in the paper underneath the hummingbird. Easily covered up though… and I like that the cards are similar, but ever so slightly different. And how sweet is this hummingbird from the Humming Along stamp set by Scrapping for Less in Collection One of the card kit. I think it’s just so cute! 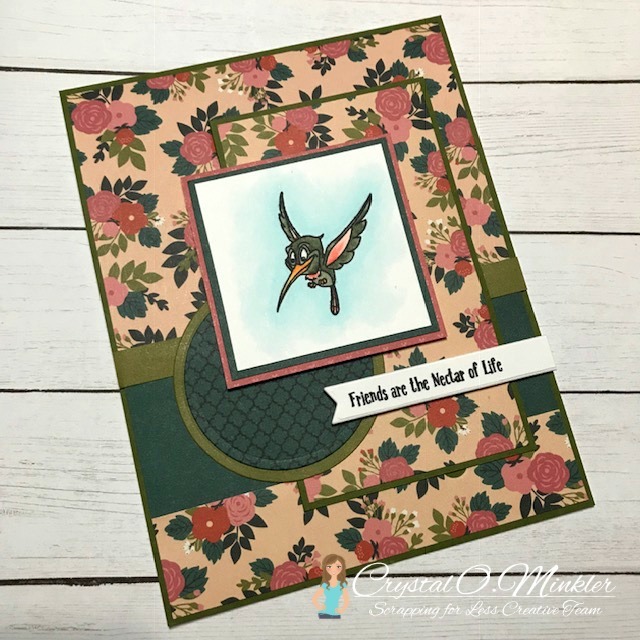 I will admit that finding a sentiment among the kit that wasn’t coffee related was a challenge, but then I realized I could mask the first portion of the “Coffee and Friends are the Nectar of Life” sentiment… and it would work perfectly with my card design! So using a post it note, I masked the “Coffee and…” portion of the sentiment and then inked up the rest of the sentiment. I removed the mask and stamped the sentiment. Easy peasy! I die cut the sentiment with a banner die and trimmed off the end. I adhered all of the elements of my cards to a couple of white card bases from my stash. Challenge complete! And I’m loving how these turned out! I used the following Copic markers to color in the hummingbirds ~ R01, R05, BG93, BG96, BG99, YR15, YR21. And I used B0000, and B000 for the blue in the background. Here’s a close up picture of the second card. I think this one is my favorite. I love how it looks like the hummingbird is getting ready to land on those flowers to get a drink! 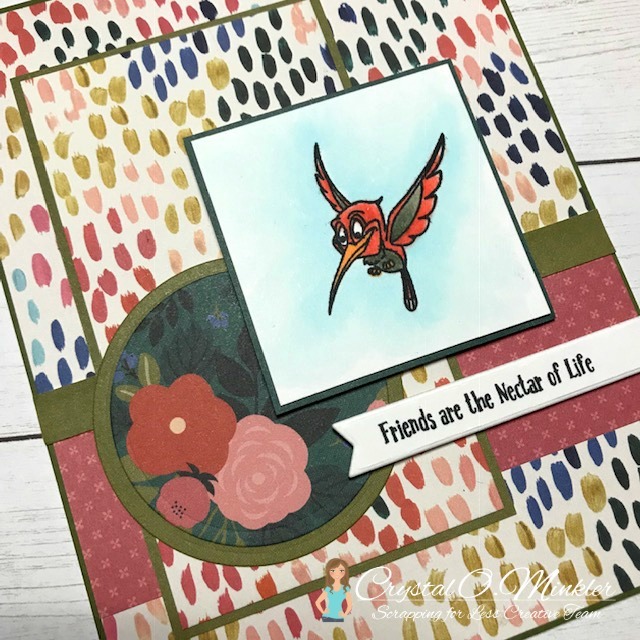 I hope these cards inspire you to maybe look at your card kits in a different way… I know my friends will love these cards and I bet they would be surprised to know that they came from a coffee themed card kit. That’s it for me this time! What a Beautiful card!! Fabulous idea.